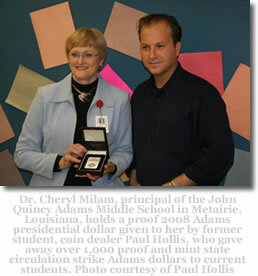 (Metairie, Louisiana) – More than 1,000 encapsulated John Quincy Adams presidential dollar coins were given free to students at the John Quincy Adams Middle School in Metairie, Louisiana in honor of the school’s principal on January 20, 2009. The gift was presented by coin dealer Paul Hollis of Mandeville, Louisiana, who attended the suburban New Orleans school two decades ago. "One of my greatest educational experiences was the gifted and talented program at Adams, and I have always wanted to do something to express my gratitude," Hollis said. The mix of proof and high-grade mint state coins were encapsulated by Numismatic Guaranty Corporation. They were distributed with certificates explaining the historical significance of the coins and also congratulating school principal, Dr. Cheryl Milam, who was named "2008 Principal of the Year" by the Louisiana Department of Education. The certificates were printed for Hollis by Crane & Co.
"Dr. Milam was an amazing teacher when I attended Adams from 1984 to 1986," said Hollis. "She helped encourage and foster my creativity and taught me so much. She even helped me start my first business, opening a salad bar at the school during my lunch break. I catered to the faculty, and it was a great experience for me." Nearly 1,050 encapsulated Adams dollars were distributed to students at a brief, special school assembly. "Handing out all the coins was a real thrill for me, and I think the students really loved them. I hope they will cherish them as special keepsakes for a very long time," said Hollis. 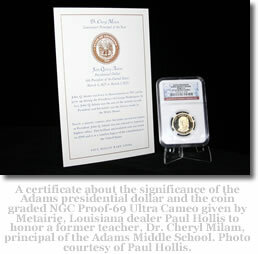 He presented Dr. Milam with a proof Adams dollar graded NGC PF-69 Ultra Cameo and housed in a wood box with a gold-colored metal label engraved, "Congratulations Louisiana’s Principal of the Year – Dr. Cheryl Milam." "I think it’s interesting the John Q. Adams dollars were struck in the same year, 2008, that my former teacher and now the school’s principal was selected for an extremely important statewide educator’s award." Hollis noticed that some things had changed at the Adams Middle School since he was a student there 22 years ago. "As Student Body President in 1986, I always enjoyed leading the Pledge of Allegiance and giving announcements over the public address system every morning. Now, it’s entirely different. They have an entire ‘cast’ involved in reading the announcement, and they even have a 12-year old weatherman!" Hollis, 36, began collecting coins at the age of six when he received an old coin from his grandmother. Today he specializes in ancient coins that circulated during the lifetime of Jesus Christ, and he also sells coins every month on the NBC Shopping Network. "I love coins, and reaching a nationwide audience has been a real thrill for me," he said. For additional information, contact Paul Hollis Rare Coins at (800) 994-0689 or online at www.PaulHollis.com.